We compare three different ways of modelling tray distillation to each other, and to experimental data: the most common way that assumes equilibrium between the liquid and vapour phases at the outlets of each tray, and two more precise methods that use irreversible thermodynamics. Irreversible thermodynamics determines the driving forces and fluxes of a system in agreement with the second law. It is shown that the methods using irreversible thermodynamics (Maxwell-Stefan equations) are superior to the method that assumes that equilibrium is reached on each tray. The Soret effect must be included to have a good description of the heat flux. ISNAD De Koeijer, Gelein , Kjelstrup, Signe . "Application of Irreversible Thermodynamics to Distillation". 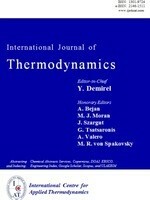 International Journal of Thermodynamics 7 / 3 (September 2004): 107-114.